A Renewable Portfolio Standard (RPS) or Renewable Energy Standard typically requires companies selling electricity to end-use customers to generate or purchase a specific percentage of its energy from renewable sources. If a seller fails to procure sufficient renewable energy, it must pay penalties. As shown in the map, 29 States and the District of Columbia have an RPS. 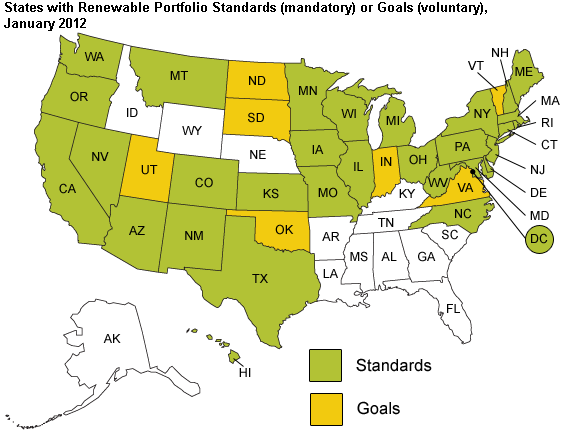 Seven states have adopted voluntary goals, which provide incentives to utilities that choose to procure renewable energy or do not penalize utilities that fail to meet the State’s target. An RPS often has annually escalating renewable energy targets. For example, Arizona’s RPS requires utilities to procure five percent of sales from renewable sources in 2015. The annual target increases by one percent each year, until it hits 15 percent in 2025. Some RPSs require a certain percentage from specific sources. For example, Nevada’s RPS requires that at least five percent of the annual RPS target be met with solar energy. In New Hampshire, energy from small hydropower facilities must meet at least 1.4 percent of the annual target. Several States require a certain percentage from small-scale distributed resources, such as rooftop solar systems. Several RPSs include energy generation from non-renewable sources. Michigan, Ohio, Pennsylvania, and West Virginia allow certain types of coal combustion to count towards compliance. Other states include energy efficiency and/or combined heat and power, also known as cogeneration, which uses fossil fuel energy to generate steam and electricity. Many RPSs have geographic or deliverability requirements. Michigan, for example, only allows renewable energy generated within its boundaries to count towards compliance. California requires most of the renewable energy to come from generators that interconnect with California’s transmission system. Rhode Island’s RPS includes renewable energy generated throughout New England or delivered into New England. A Renewable Energy Credit or Certificate (REC) is a tradable commodity that represents a specific amount of energy generated from a renewable resource. RECs are tracked by a certifying organization that gives each REC a unique identification number. Companies with obligations to procure renewable energy under an RPS typically demonstrate compliance by taking a sufficient number of RECs out of the market. For example, if an RPS required an electric distribution company to procure ten percent of its energy from renewable sources, that distribution company would surrender to state regulators or retire in a certifying organization’s database RECs equivalent to ten percent of its sales. Some States require distribution companies to hold bundled RECs, which are sold with their associated energy. Unbundled RECs are sold separately from the energy. Non-electric companies, such as retailers or manufacturers, purchase unbundled RECs to demonstrate that they are using clean energy. Some States also allow electric distribution companies to use unbundled RECs to demonstrate RPS compliance. Several RPSs include incentives for energy generated by specific types of facilities. Those incentives typically take one of two forms: REC multipliers or special RECs. Washington State encourages smaller scale distributed generation by allowing facilities smaller than five megawatts to generate two RECs for every megawatt hour of renewable energy, twice the rate of larger facilities. New Jersey encourages solar generation by allowing solar facilities to generate S-RECs and requiring distribution companies to buy S-RECs to demonstrate compliance with the State’s solar mandate. S-RECs are typically higher-priced than RECs generated by other energy sources.